Keith Thomson hasn't added a story. Hi, my name is Keith Thomson and I am the evangelist working with the Armadale church of Christ in the southern suburbs of Perth, Western Australia. I am asking you to consider helping a young Christian man, Caleb Robinson, fulfil a long held goal of his - that is to attend the Texas Preaches Study and the Oklahoma City New Years meeting this year. Caleb is a wonderful young Christian man. He truly loves the Lord and is taking an increasing role in assisting in the worship of the church. He is one of our song leaders and he is studying with me to learn how to fulfil other roles in worship leadership. 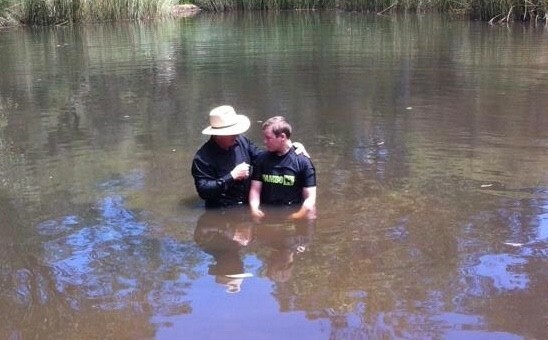 I had the honour of baptising Caleb in February 2014 and he has continued to grow in knowledge and understanding. Caleb believes that visiting these two wonderful meetings will help him grow as a Christian and he is looking forward to meeting other Christians of his age. He has just graduated from High School this month and this will be a trip of a lifetime. Please help in whatever way you can. Of course we would love you to help by sending some money, but if you can't, please share this fundraiser with your friend on FaceBook and else where. Thank you so much for your help and I look forward to hearing from you. Keith Thomson hasn't posted any updates yet. Keith Thomson is managing the funds for this campaign. The campaign is for a personal cause.